fun fit flavor. : Quick post for quick recipes! I decided to 'tweet' to my friends today to ask for a topic for tonight's post. Ask, and you shall receive. The consensus was quick, easy, meals that are not overwhelmed with veggies. I know, I know - too many salad meals lately... I got it. Thanks for the inspiration for tonight's post, guys! Here's what I got for ya! First, staples for your kitchen: Barilla protein plus pasta, garlic, crushed red pepper, lemon, salt, parsley (fresh and/or flake), basil (fresh and/or flake), extra virgin olive oil, low sodium chicken broth. My mom taught me this YEARSSSS ago... you can make any meal with the above listed ingredients highlighted in blue (you can add more but this is a base that will never fail you!) Sauteing chicken before grilling it, sauteing with pasta, etc etc. Ok next, I've already discussed in past posts why I love Barilla Protein Plus Pasta so much. Quickly, it tastes great, it's loaded with protein, fiber, and omega-3's, and it's versatile. Here's an article with more: http://bit.ly/ITiwmb. 1) Cook the pasta and then saute it with the items listed above in blue. Done. 2) Cook the pasta while sauteing the items in blue, use the basil instead of parsley, dice a tomato - add it to the pan. Pour over pasta. Done. 3) Cook the pasta while sauteing the items in blue, remove the basil, add capers and artichokes (frozen or canned), extra lemon, a little bit of chicken broth. Pour over pasta. Done. 4) Cook the pasta while sauteing the items in blue, at the end - toss with arugula. Add a tablespoon of parmesan cheese. Done. 5. Cook the pasta while sauteing the items in blue, at the end - toss with spinach, add a tablespoon of feta. Done. TIP 1: Add chicken (or another protein) to any of the above meals. Salmon pairs really well with numbers 3 and 4. Shrimp pairs well with all. How to cook chicken quickly? Defrost 2 tenderloins or one breast in HOT water while you are cooking or as soon as you get home from work. (I do this every day) Marinate in the blue items and toss on a grill pan or saute pan. TIP 2: Vegetarians: Instead of chicken, use walnuts or chickpeas. 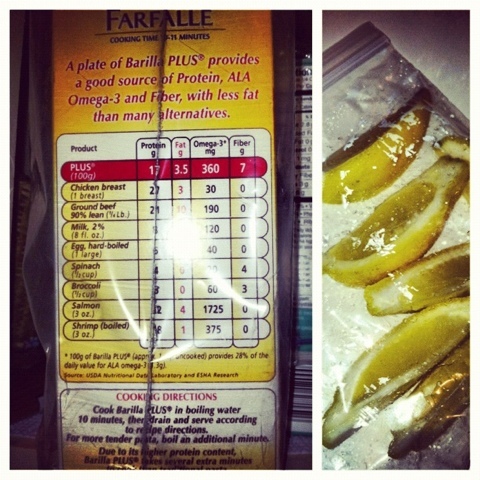 TIP 3: Buy a bag of lemons once per week. Take one out and cut into perfect slices to add to meals, water, etc. throughout the week. One more meal that's quick and healthy but does not involve pasta. First, grill your protein (chicken, salmon, etc) (BTW I am obsessed with my grill pan - healthier than saute pan). Next, microwave a sweet potato. Most come with instructions. Orrrrr you can cut it into chucks and boil until you can stick a fork in them. THEN add them to a pan and bake until they are done. Boiling them first cuts down on cooking time in the oven. Serve it with a drizzle of olive oil and little bit of salt. Don't use spray butter - it's loaded with chemicals. You're better off using a small little tab of butter. Seriously. Finally, pair with a spinach salad. (Spinach, tablespoon of feta, teaspoon of extra virgin olive oil and squirt of lemon. TIP: When you eat nutrient rich vegetables - eat them with some kind of monounsaturated fat: extra virgin o/o, avocado etc. WHY? Your body needs fat to absorb nutrients properly. Ok, have a great week, everyone!!! Let me know if I can better explain any of the above listed recipes. Your article is very effective .. because it is easy to understand and lots of information ! !